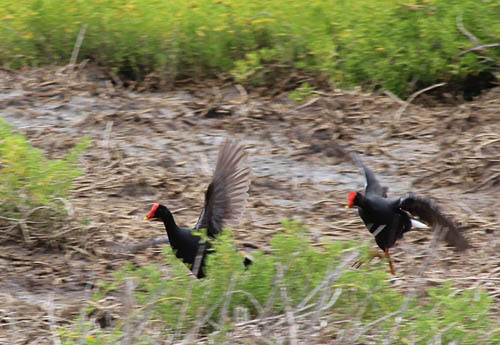 For the past several months, I have been hiking in and around the marshes and wetlands of windward Oʻahu looking for ʻalae ʻula or Hawaiian moorhen. 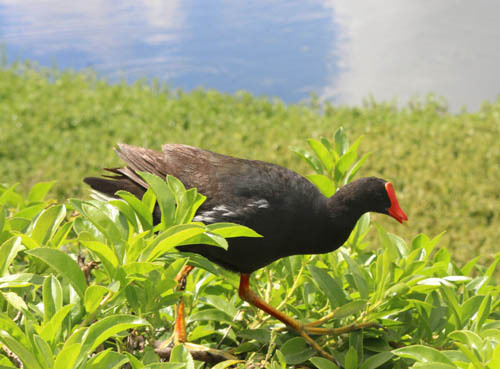 The Hawaiian Moorhen, also known as the Hawaiian gallinule or mudhen (Gallinula chloropus sandvicensis) is one of 12 subspecies of Common Moorhen, found in the Americas, Africa and Eurasia. 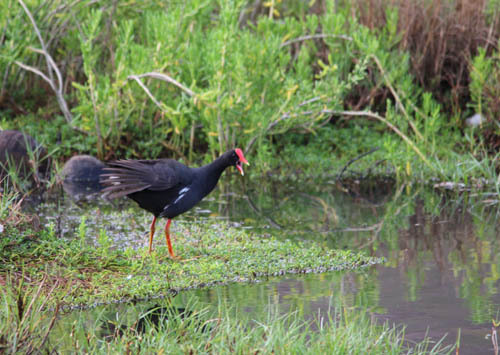 ʻAlae ʻula are on the federal list of endangered species and inhabit wetlands, marshes and taro patches. Current population estimates range from 150 to 900 birds left in the wild. 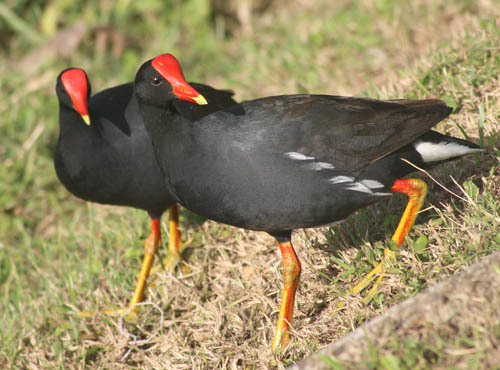 Moorhen are almost found only on O‘ahu and Kaua‘i, with few on Molokai, Maui and Hawai‘i Island. 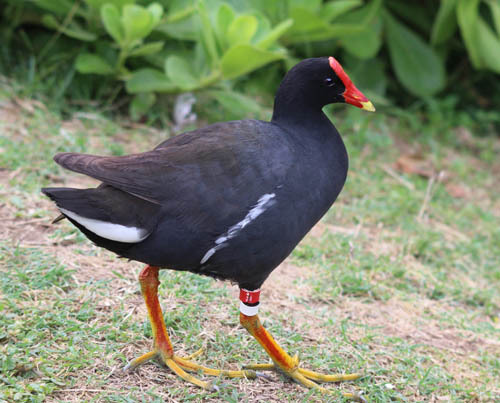 Efforts to reintroduce moorhen on Hawai‘i Island and Maui have not been successful. The most distinguishing feature of ʻalae ʻula is its brilliant red frontal shield and beak which has a yellow tip. The waterbird is about 12 inches long, with a black head and neck, and a slate-gray to bluish-black back, with white undertail and flank feathers. 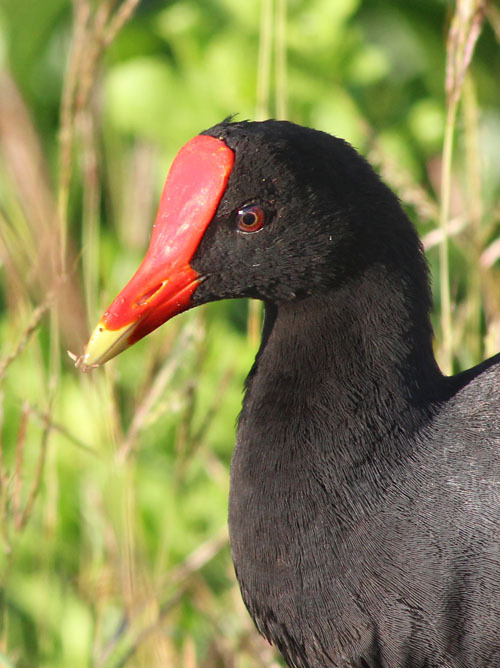 Hawaiian legend says the moorhen knew the secret of fire and was scorched by flames, giving the bird its red frontal shield. The demigod Maui went on a journey to catch and force the ‘alae ‘ula to yield the secret of making fire. 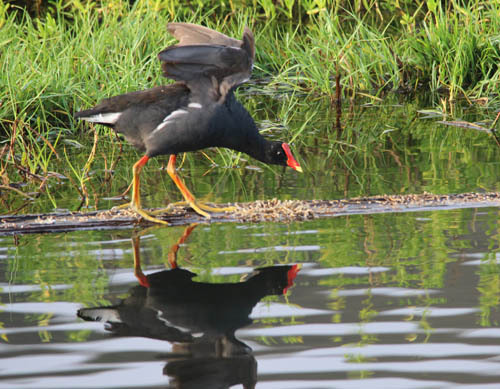 Moorhen have large feet and toes — bright yellow and red in color — which enable them to spread their weight and walk across floating wetland vegetation where the bird hide and build their nests. 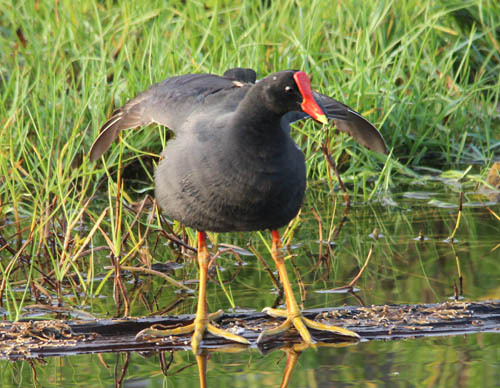 Moorhen can be found in the marshes, ponds, wetlands at Kawainui, Hamakua, Kaelepulu, Hoomaluhia, and Kahuku. The birds dive for fish as they forage for food on the along the banks of the stream. 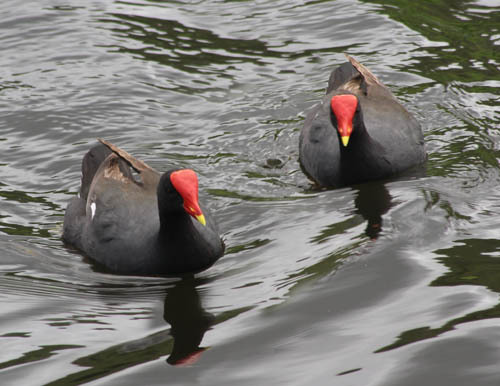 During breeding season the bird’s frontal shield can become enlarged and deeper red in color. The birds puff their feathers up and spread their wings along the edge of the stream. They drop their heads downs in a threat display to ward-off and fight rivals. 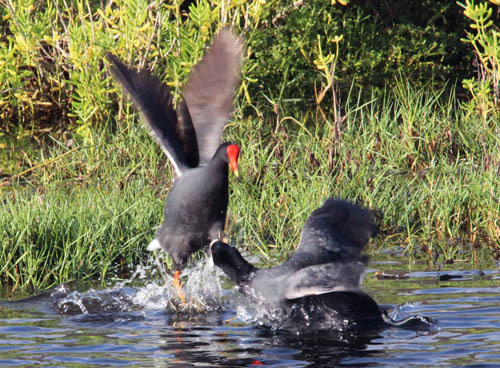 Skirmishes break out and the birds fight and chase each other all over the marsh. 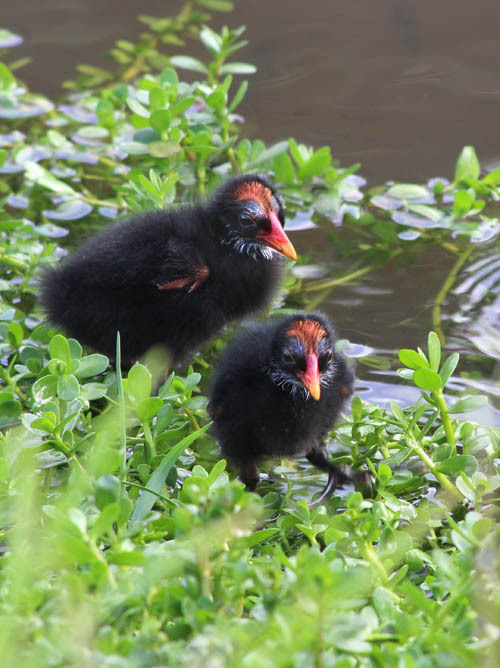 Moorhens hide their nests in dense cover and lay from five to nine cream-colored eggs which are spotted with grey, black and brown. The eggs incubate for about 22 days. 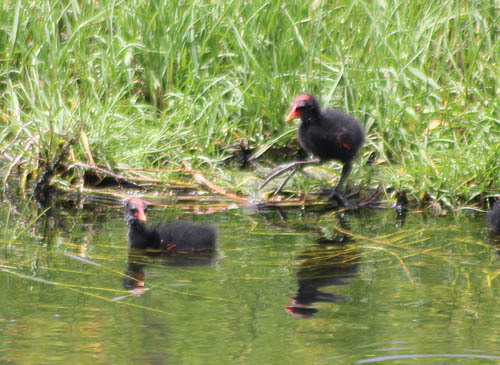 During nesting season, ʻalae ʻula are very protective of their nesting sites and broods. When the chicks hatch they are covered with black down, except their heads — which are bald and red. The baby chicks have bulging eyes and huge feet and are able to walk and swim soon after hatching. The chicks are always hungry and call out to their parents for food. 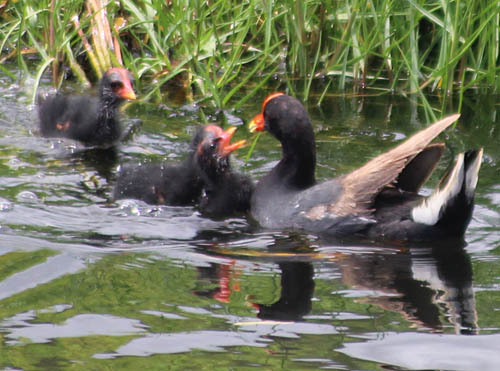 The little chicks swim out to their parents to get a morsel of food. The goofy looking chicks have bald red heads, bulging beady eyes, and straggly white beards — so ugly they’re cute — a face only a mother could love. 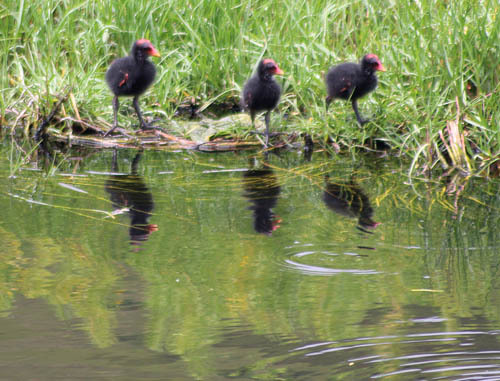 The main breeding season for ʻalae ʻula is March through August, but they breed year round. So keep your eyes open in the marsh. SO cute! There were chicks here at TBR some years ago but that was before I knew they were endangered and endemic. Thank you for the pics and info here. So cute! Thanks for the great pics and info here. 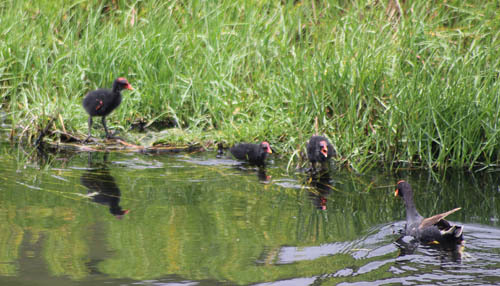 We had chicks at TBR water hazard behind my condo but that was before I was paying attention/knew they were endemic and endangered. Hoping for some more soon. Very nice pictures. National Geographic quality. Thank you Nate for sharing. I am conducting a bird watching tour this morning and I wound this very inspirational. The photos of the chicks are exquisite.